Flour that is used in baking comes mainly from wheat, although it can also be milled from corn, rice, nuts, legumes, and some fruits and vegetables. The type of flour used is vital at getting the right results in the end product. Different types of flour are suited to different items, and all flours are different. You cannot switch from one type to another without consequences that could ruin the recipe. To achieve success in baking, it is important to know what the right flour is for the job! Food Nutritional Value Chart – Check out the Food Nutritional Value Chart that shows Fat Grams, Carbohydrates Grams, and Calories for the flours (listed below) used in baking. All-Purpose Flour – A blend of hard and soft wheat; it may be bleached or unbleached. It is usually translated as “plain flour.” All-Purpose Flour has 8% to 11% protein (gluten). All-purpose flour is one of the most commonly used and readily accessible flour in the United States. Flour that is bleached naturally as it ages is labeled “unbleached,” while chemically treated flour is labeled “bleached.” Bleached flour has less protein than unbleached. Bleached is best for pie crusts, cookies, quick breads, pancakes and waffles. Use unbleached flour for yeast breads, Danish pastry, puff pastry, strudel, Yorkshire pudding, lairs, cream puffs and popovers. Almond Flour (Gluten Free) – Just a touch of this flour (about 1/4 of the flour mixture) is all you need to add moistness, a little binding, light almond flavor, and density to baked goods. It is especially good in pastry crusts, cookies, and quick breads. Amaranth Flour (Gluten Free) – Amaranth is an ancient grain and the word amaranth means “everlasting” in Greek. Amaranth contains more protein than any other gluten-free grain and more protein than wheat flour. You can substitute up to 20 to 25% of the flour used in your recipe with this flour. Barley Flour (Low Gluten) – A non-wheat flour made from grinding whole barley. It is a popular alternative to wheat flour because, unlike many non-wheat flours, it contains some gluten. This flour has a mild, but very slightly nutty taste. This flour also has slightly fewer calories and more than 4 times the fiber of all-purpose. By using barley flour instead of all-purpose flour, you triple your fiber intake. When making yeast bread recipes, there is not enough gluten in barley flour to properly develop the bread, and it is recommended swapping only one quarter of all-purpose flour for barley flour in yeast bread recipes. Great in quick breads and pancakes. Bread Flour – Is white flour made from hard, high-protein wheat. It has more gluten strength and protein content than all-purpose flour. It is unbleached and sometimes conditioned with ascorbic acid, which increases volume and creates better texture. Bread flour has 12% to 14% protein (gluten). This is the best choice for yeast products. Buckwheat Flour (Gluten Free) – It is packed with nutrients, readily available, easy to work with and has a nice nutty flavor. Check out the article Buckwheat Flour – Adds Nutrients and Flavor to Baked Goods. Cake Flour – A fine-textured, soft-wheat flour with a high starch content. It has the lowest protein content of any wheat flour, 8% to 10% protein (gluten). It is chlorinated (a bleaching process which leaves the flour slightly acidic, sets a cake faster and distributes fat more evenly through the batter to improve texture. When you’re making baked goods with a high ratio of sugar to flour, this flour will be better able to hold its rise and will be less liable to collapse. This flour is excellent for baking fine-textured cakes with greater volume and is used in some quick breads, muffins and cookies. If you cannot find cake flour, substitute bleached all-purpose flour, but subtract 2 tablespoons of flour for each cup used in the recipe (if using volume measuring). Chickpea Flour (Gluten Free) – Also know as garbanzo flour, gram flour, and besan. Made from dried chickpeas ground into a flour. Used in many countries, it is a staple ingredient in Indian, Pakistan, and Nepal cuisines. You can use this flour as an egg substitute in vegan cookery. You can substitute up to half the amount of all-purpose flour called for in a recipe with chickpea flour. It is also very easy to make your own Chickpea Flour by processing dried chickpeas in your blender or food processor. Coconut flour (Gluten Free) – It is ground from dried, defatted coconut meat. It is high in fiber, and low in digestible carbohydrates. It has a very light coconut flavor. Coconut flour can replace up to 20% of the flour in a recipe, but you will need to add an equal amount of liquid (oil) to compensate as this flour soaks up the liquid. You will also need more eggs – usually double the eggs (or more). Corn Flour (Gluten Free) – It is a powdery flour made of finely-ground cornmeal and is milled from the whole kernel. Corn flour comes in yellow and white and is used for breading and in combination with other flours in baked goods. White corn flour is used as a filler, binder and thickener in cookie, pastry and meat industries. Instant Flour (Wondra from Gold Medal) – Is granular and formulated to dissolve quickly in hot or cold liquids. It will not work as a substitute for all-purpose flour, although there are recipes on the container for popovers and other baked goods. It is used primarily in sauces and gravies. Farina Flour or Meal: Flour or meal (of grain or starchy roots.) Also sold as Cream of Wheat, farina is made from the endosperm of the grain, which is milled to a fine granular consistency and then sifted. Although the bran and most of the germ are removed, this cereal is sometimes enriched with B vitamins and iron. Farina is most often served as a breakfast cereal, but can also be cooked like polenta. Its name comes from the Latin word for meal or flour, which in turn traces to far, the Latin name for spelt, a type of wheat. Farina was the first genuine flour before milling stones. Millet Flour (Gluten Free) – Millet is one of the oldest foods known and possibly the first cereal grain to be used for domestic purposes. Millet flour is most commonly used in desserts and sweet breads largely because of the grain’s naturally sweet flavor. When substituting for wheat flour, it is usually best to start with about a 3-to-1 ratio of wheat to millet. Oat Flour (Gluten Free) – This flour tends to make a baked good more moist than wheat flour. It is made from ground whole oats – yes the old-fashion oats used for cereal. It is very easy to make your own oat flour. Just place the dried oats in your blender and grind. 1 1/4 cups rolled oats makes 1 cup oat flour. Organic Flour – Used in the same way as regular flour. It must follow U.S. Department of Agriculture regulations to be labeled “organic.” Using this flour is a matter of personal preference. Pastry Flour – Also is made with soft wheat and falls somewhere between all-purpose and cake flour in terms of protein content and baking properties. Pastry flour (also known as cookie flour) has a protein (gluten) of 9% to 10%. Use pastry flour for making biscuits, pie crusts, brownies, cookies and quick breads. Pastry flour makes a tender but crumbly pastry. Do not use it for yeast breads. Pastry flour (both whole-wheat and regular) is not readily available at supermarkets, but you can find it at specialty stores and online. You can try to mimic it by using a 2-to-1 ratio of all-purpose flour to cake flour. Pumpernickel Flour (Low Gluten) – This flour is made from coarsely-ground whole rye berries. It is the rye equivalent of whole wheat flour. Pumpernickel breads tends to be dense, dark, and strongly flavored. Quinoa Flour (Gluten Free) – It is one of the most nutritious grain flour available. Quinoa is considered a grass/seed and not a grain. This powerful little grain is a great addition to any diet, but is an ideal solution for those following a gluten free, vegan or vegetarian diet. You can substitute this flour for 1/2 of the all-purpose flour in many recipes or completely replace wheat flour in cakes and cookie recipes. This is a very expensive flour to purchase. Rice Flour (Gluten Free) – Rice flour is a form of flour made from finely milled rice. This flour can be made from either white or brown rice and can be used interchangeably. White Rice Flour (also called Mochik) is lighter, milder, and easier to digest than wheat flour. Some people find white rice flour to be slightly gritty, but many find it preferable to bean flours. It is great as a thickening in sauces. You can also make your own rice flour – just place rice of your choice (white or brown) in your blender and process until it forms a powder. Rye Flours (Low Gluten) – There are light, medium, and dark colored varieties of rye flour. The color of the flour depends on how much of the bran has been removed through the milling process. It is also a low gluten flour. Rye bread may be a better choice than wheat bread for persons with diabetes. Because rye flour is low in gluten, a general rule suggests substituting 1/3 of the amount of rye with wheat flour to ensure the bread will rise properly. Self-Rising flour – Also known as Raising Flour and sometimes as phosphated flour, is a low-protein flour with salt and leavening (baking powder) already added. About 1 1/4 teaspoons of baking powder and a pinch of salt have been added during milling for every cup of flour. It is especially suited for biscuits, muffins, cakes, and pastries. It is also available bleached or unbleached. It is most often recommended for biscuits and some quick breads, but never for yeast breads. Exact formulas, including the type of baking powder used, vary by manufacturer. Recipes that call for self-rising flour do not call for the addition of salt or leavening agents. Semolina Flour – It is used in making pasta and Italian puddings. It is made from durum wheat, the hardest type of wheat grown. The flour is highest in gluten. When other grains, such as rice or corn, are similarly ground, they are referred to as “semolina” with the grain’s name added, i.e., “corn semolina” or “rice semolina.” There are difference grades. Sorghum Flour (Gluten Free) – A very good substitute for wheat flour in many recipes, especially if combined with other, more denser, flours. Soy Flour (Gluten Free) – Made from ground soy beans. Full-fat and low-fat soy flours work best in sweet, rich, baked goods like cookies, soft yeast breads, and quick breads. Soy flour can be substituted approximately 10% to 30% of the wheat or rye flour in your recipes. Spelt Flour (Low Gluten) – One of the most popular and widely available of alternative baking flours. The full name of spelt is Triticum aestivum var. spelta. Triticum denotes that it is of the wheat family, but the fats are more soluble and the nutritional content higher than traditional wheat flour. People who have issues with wheat digestion, but who are not gluten, will tolerant often do well with Spelt. Spelt flour has a nutty and slightly sweet flavor similar to that of whole wheat flour. It does contain gluten and is a popular substitute for wheat in baked goods. Check out the article on Spelt Flour – Add Spelt Flour to your Diet for Variety and Nutrition. Tapioca Flour (Gluten Free) – It is also known as tapioca starch. It is a starchy white flour with a slight sweet flavor. 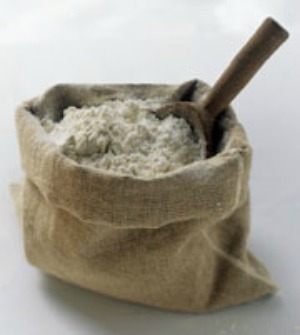 This flour is make from the starch extracted from the South American cassava plant. It helps bind gluten-free recipes plus improves the texture of baked goods and is also an ideal thickening agent. Use tapioca for thickening a wide variety of baked goods, sauces, and desserts. This flour can also be used to replace corn starch (use 2 tablespoons tapioca flour for each 1 tablespoon corn starch). Teff Flour (Gluten Free) – Teff is an ancient and intriguing grain, tiny in size yet packed with nutrition. It is simple to prepare and similar to millet or quinoa in cooking. Teff is a great addition to your diet for nutrition, taste, and variety. It is higher in protein than wheat and has a high concentration of a wide variety of nutrients, including calcium, thiamin, and iron. Since the grains are so small, the bulk of the grain is germ and brand. It is very high in fiber and is thought to benefit people with diabetes as it helps control blood sugar levels. Teff is excellent in making dark breads and rye breads. Check out the article Teff – A Nutritious and Versatile Grain. Whole-Wheat Flour (Low Gluten) – Also called graham flour. It is made from the whole kernel of wheat and is higher in dietary fiber and overall nutrient content than white flours. It does not have as high a gluten level, so often it’s mixed with all-purpose or bread flour when making yeast breads. Whole wheat flour is equivalent to British whole meal flour. Look for tightly sealed bags or boxes. Flours in torn packages or in open bins are exposed to air and to insect contamination. Flour must be kept cool and dry. All flours, even white flour, have a limited shelf life. Millers recommend that flours be stored for no more than 6 months. The main change that occurs is the oxidation of oils when flour is exposed to air. The result of this is rancid off flavors. During hot weather, store flour in the refrigerator. Flour should be stored, covered, in a cool and dry area. This prevents the flour from absorbing moisture and odors and from attracting insects and rodents. Freezing flour for 48 hours before it is stored will kill any weevil or insect eggs already in the flour. It is better not to mix new flour with old if you are not using the flour regularly. Do not store flour near soap powder, onions or other foods and products with strong odors. If freezer space is available, flour can be repackaged in airtight, moisture-proof containers, labeled and placed in the freezer at 0 degrees F. If flour is stored like this, it will keep well for several years. Keep whole wheat flour in the refrigerator the year around. Natural oils cause this flour to turn rancid quickly at room temperature. Throw away flour if it smells bad, changes color, or is invested with weevils. Flour is always readily available so it should only be brought in quantities that will last a maximum of two to three months. Put a bay leaf in the flour canister to help protect against insect infections. Bay leaves are natural insect repellents. Regarding semolina, I have read it’s high in protein but contrary to what you’re saying, low in gluten. Can you please clarify? Thank you. Gluten is form by mixing 2 proteins that are in wheat – glutenin and gladnin. There is no gluten until the two proteins are mixed (kneaded) together. This allows the baker to control the amount of gluten in the product. The amount of gluten that can be produced from each wheat varietal depends on the ratio of glutenin and gladnin that natural occurs in the wheat kernel. So you can have a high protein product (high in glutenin but no gladnin) and also have no gluten. Pastry flour, whether whole wheat (sometimes called white whole wheat) or white gives a much crumblier texture. It is often used for things like pie crusts, cookies, or biscuits. It is not good for cakes or breads where you want a more consistent texture. I have worked as a baker and have had some experience with it, I think it lacks the gluten necessary to make good breads. Just to clarify, white whole wheat flour (pastry flour) is ground from a soft white wheat. There is also a white whole wheat flour ( for making bread) that is ground from a hard white wheat. The latter www has the gluten needed to be able to make bread, the former does not, which is why it is better for cookies, cakes etc. King Arthur sells both varieties of this flour. I use a fourth coconut flour, a half white flour, and then all purpose gluten free flour and add 1 tsp. caraway seeds that ends up tasting like a light rye bread with no rye flour. Still testing more options to be gluten free. Flour was my biggest issue to be gluten free. If I put bay leaf in my flour canister, doesn’t it will leave smell in the flour? Hello, I really love all the information on your site. I look up a lot of information for my online classes. I want to ask if I could use some of the material featured on your page. My page is listed above. Thank you. Hello Regina- You are welcome to reference the history “summarized in your own words”, please do not copy verbatim. You are also welcome to adapt a recipe with your own photos. Please reference the recipe and history back to What’s Cooking America by providing a link on your post. Thanks! What is the deal with 00 flour? I read what you wrote about all purpose flour but how does 00 compare to all purpose? What is 00’s protein content percentage? Lastly, which one of those two flours would you recommend is best to make pizza? I’ve used all purpose and it works well but I wonder if 00 is better or worse. I don’t know. Please help. Thank you. My dog is allergic to wheat and soy. Would chickpea flour be ok if it’s in dog treats? I am sorry, but I can not answer this question. Maybe someone else can help you. Chris, I’m not a veterinarian but if your dog isn’t allergic to or doesn’t have a food sensitivity to garbanzo beans and you’ve established that garbanzo beans are safe in general for dogs to ingest, then try it but you should first check with your dog’s veterinarian on this. Thank you for sharing this. My wife is fond of baking and I’m going to share this to her. I know she’ll going to love this article. Baking is my pastime, and this information is really helpful to me. I have never really used other flours besides all-purpose flour, bread flour, and cake flour since I’m not sure how my baked goods would taste or turn out when using the flour. Thank you for the useful information! Elizabeth, I am also a transplant from US to Canada. I don’t have a solution to your dilemma, other than to bring a bag of US flour with you from the US. I have never been bothered at the border and usually declared that I have a “bag of groceries?” In contrast, I bake a lot of breads and love / prefer my Canadian flours now relative to those typical American supermarket varieties of all purpose flours. I usually use Rogers brand flours, some of which come in minimally processed varieties, much better than those super processed US brands. . It is modestly priced but only available in certain limited chains.